The digestion of the food starts in your mouth! When you chew your food, it mixes with saliva. The saliva contains two very important enzymes; one is called lipase which has the function of breaking down fat and the other enzyme, amylase, breaks down carbohydrates. Yes, the digestion of the food starts in your mouth when saliva mixes with your food. When you eat too quickly, it doesn’t have time to mix with saliva; it directly goes into the oesophagus and then into your stomach, and it’s not pre-digested. 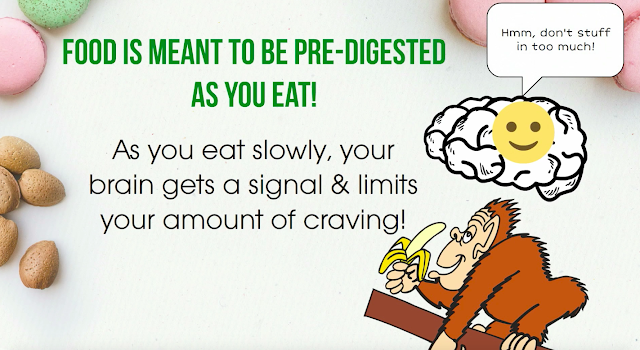 Your food is meant to be pre-digested as you eat! Lipase starts breaking down fat and amylase breaks down carbohydrates right in your mouth. 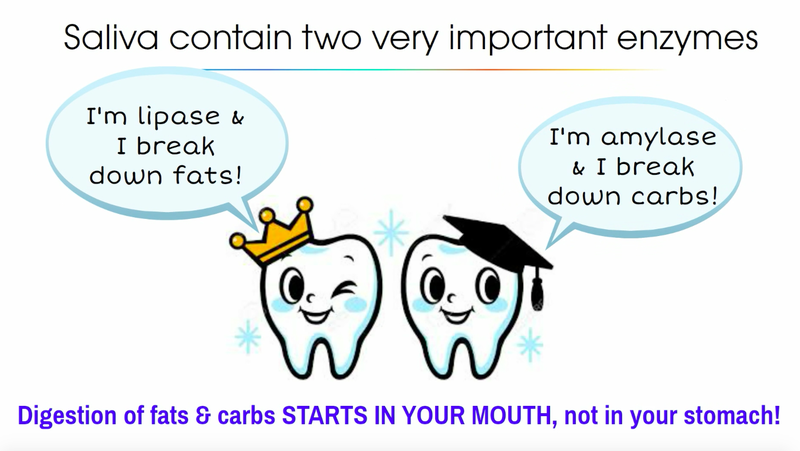 Therefore, the digestion of fats and carbs doesn’t start in your stomach; it starts in your mouth. There is a very important reason why that’s happening, because the moment the digestion of carbs and fats starts in your mouth, the brain gets a signal that it’s receiving carbs and fats and that limits the amount of craving that you will have for food. 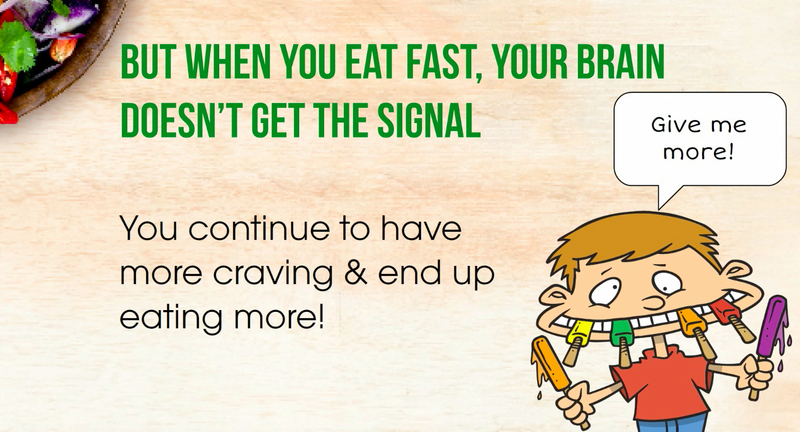 But when you eat quickly, your brain doesn’t get that signal and you continue to have more craving, you continue to feel hungry, and you end up eating more and more food because your brain still waiting for that signal to get carbs and fats. 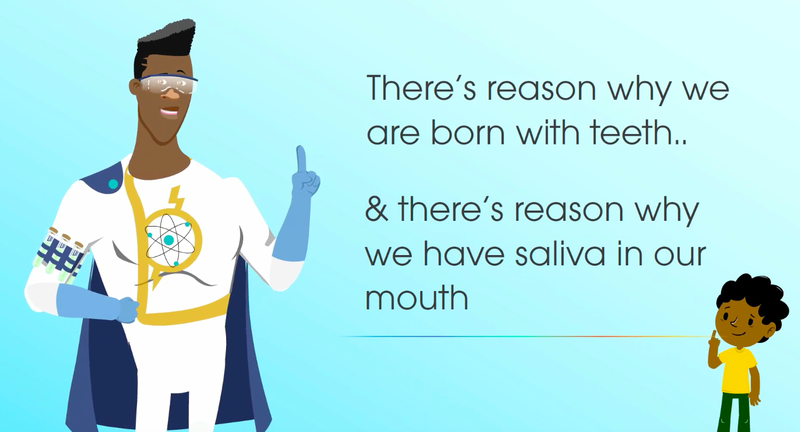 So, it’s extremely important to understand your saliva has a role. Also, when you chew, the bones holding your teeth get a 'workout', helping to keep them strong. The saliva produced while chewing is helping to clear food particles from your mouth and wash away bacteria, so there is less plaque buildup and tooth decay. Eating healthy & still struggle to lose weight? We know people who eat extremely healthy, viz., salads, fruits, and all the super foods available and they still have nutritional deficiencies. We know people who eat healthy & exercise hard and still struggle to lose weight. Most of the answers can be in your digestion and the way you eat your food. Nutrients from the food that you eat need to be absorbed by your intestine and sent into your blood to your cells. For that nutrition to reach to your cells, correct amount of digestion has to happen. Again it starts in your mouth! 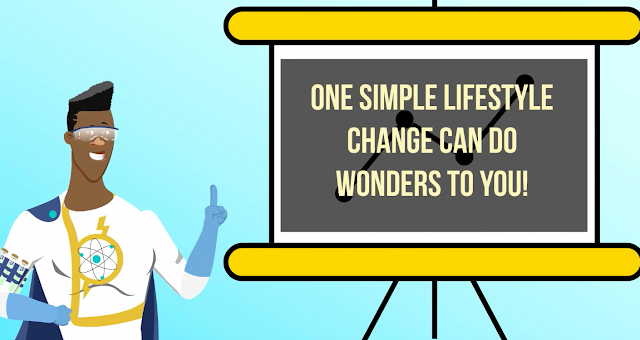 You break down food particles into smaller particles; it passes through your stomach, gets digested, goes into your intestine in a size where nutrients can be extracted before they are sent to all your cells. In contrast, when you eat food quickly and send down larger chunks of food into your stomach, you lose most of the nutrition contained in your food even if you are eating extremely healthy. Add to that, a lot of undigested food particles get into your blood system. Your intestines have good and bad bacteria, and the good bacteria takes out the nutrients and sends them into your cells. 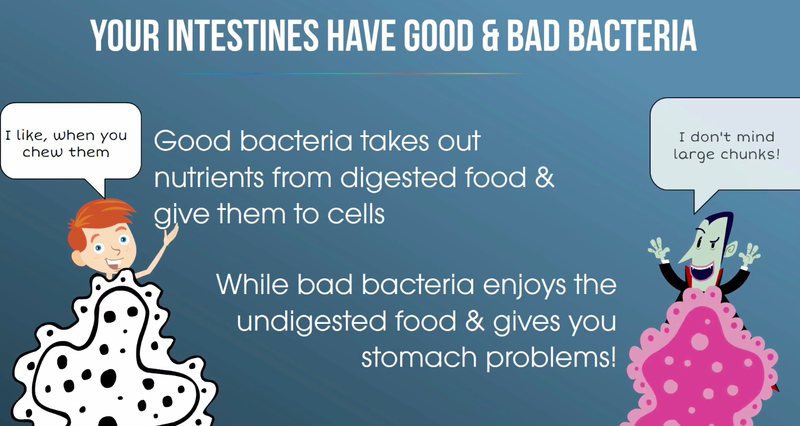 But when you have undigested food particles, you are actually feeding the bad bacteria and that’s when you have bloating, diarrhoea, constipation, abdominal cramps. and flatulence. It’s because you allow the undigested food to putrefy in your intestines. When pre-digested food from chewing reaches your stomach, your stomach has to produce the right amount of acid to break down already pre-digested food and your whole digestion system gets much better. So, remember when you eat fast you are sending large particles into your stomach because it’s not pre-digested with your saliva, and the stomach needs to produce more and more acid to break down that food, killing nutrients, presenting you with the byproducts of bloating, flatulence, indigestion, constipation, diarrhoea, stomach cramps again. The best way to lose weight is to start chewing your food! Try it out next time you have your lunch or dinner. When you chew your food properly, you are sending signals to your brain that you are receiving carbs and fats and you stop craving for more food, which means lesser amount of food fills you up, lesser calorie intake and you lose weight. One of the main reasons why people put on weight is due to over consumption of food. We all know that it’s calorie at the end of the day. Whatever your body doesn’t use, they get stored as fat. So, try chewing your food and eat it really, really slowly and mindfully, and you'll be surprised that you will be fuller much, much quicker with food still left on your plate. Now, imagine the amount of “less calorie intake” you gain by chewing it right. Also, see what happens when you push down large particles through your food pipe (obviously they are not pre-digested in your mouth), it actually scrapes against the mucosal lining of your food pipe (oesophagus), creating more and more problems for you. If you have a weak oesophagus and you have too much acid, it can cause acid reflux, which is the burning sensation in your throat, and eventually lead to the cancer of oesophagus. Many people continue to take antacids to counter acidity, but you can take control of it just by eating the right way and also staying away from the side effects of those medications. 75% of energy in human body goes towards digestion! And that’s because we eat so much. Our digestive system ends up using so much energy to break down food which should have been pre-digested in our mouth. In other words, if we can prevent the digestive system from stealing this energy, it would allow our cells to use it to make us feel stronger, more energetic throughout the day. So help your body to distribute its energy equally to the billions of cells which is your immunity. If you send right nutrients to your cells, you profit from stronger cells, stronger immunity, less aches & pains, and more alkalinity in your body which means weight loss becomes easier! Yes, one small lifestyle change of chewing can do wonders to you! Great Tips. Thanks for sharing valuable weight loss tips. Glad to know that it was helpful! Thanks.